We aren’t going to lie to you — language learning takes serious time and effort. The good news is, with some dedication and these effective time-management tips, you can do it. One of the most common language-learning laments we hear from prospective polyglots is that they simply don’t have enough time to learn a new language, but we believe in our learners! 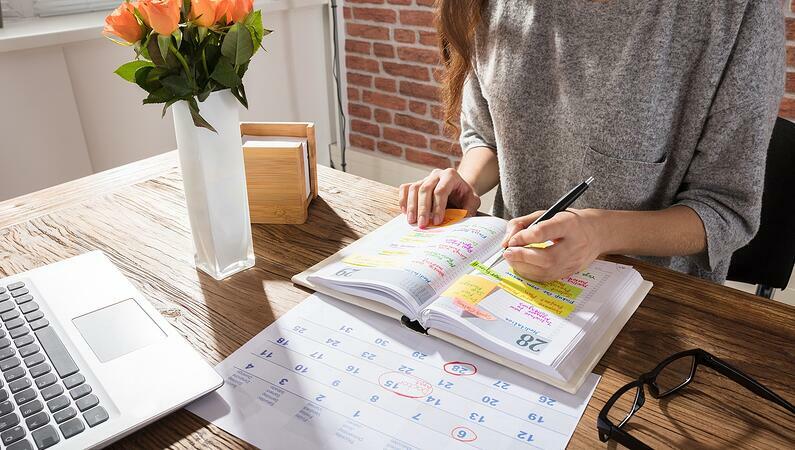 That’s why we’ve created this time-management action plan to empower you with helpful study habits so you can start experiencing the benefits of learning a language well before reaching fluency. Ask yourself, what are your language-learning goals? Whether you’re learning French to study abroad or Korean to watch your favorite Kdramas, find a language-learning resource that offers breakdowns and helpful conversational and grammar goals at the beginning of each chapter, so that you can easily structure your learning schedule. This way, every step will move you towards a larger, achievable objective, without leaving you feeling overwhelmed. According to experts, learning a language to a medium-advanced level can take anywhere from 600–2,200 hours, depending on your native and target language. You will need to put in more than just 5–10 minutes a day if you want to learn a language anytime soon — so consider your personal habits and make language learning a priority in your schedule. And remember, consistent studying with breaks in between works better than cram sessions once a week — your brain needs time to absorb and process all of the new information! Try changing your homepage to a language-learning website, blog, or news site in your target language as a daily reminder. Or, if you tend to waste time scrolling through social media first thing in the morning (guilty…), make time to work through a few language lessons on your phone instead. The more frequent your exposure to the target language, the more fluent you’ll become, so make your schedule work for you! Driving around looking for a coffee shop wastes precious study time. Your ideal study space will be accessible — so look for a resource with offline access. You can download lessons for studying in places without data or internet connectivity. Or, use your resource’s offline capabilities to study without distractions by turning off your internet connection to prevent falling into a YouTube time warp (seriously, where does the time go?) and get in a quality language-learning session instead. A peaceful room, clean desk, incense burning, color-coded sticky notes, and a wide array of pens to choose from… sounds Ikea-picture-perfect, right? The reality is, we can’t always find the perfect time and place to study — and that’s okay! Language-learning software opens up the opportunity to study anytime, anywhere, but make sure your software has the most efficient and effective learning features first before you commit. Look for a language-learning resource with hands-free features and apps available on your mobile platform (Apple App Store or Google Play Store) so you can study on the go. Whether you’re at the gym, stuck in traffic, or up to your elbows in your next international cooking endeavor, use an app with auto play and bluetooth features to practice listening and speaking in your target language. You can make language learning fun and real-world applicable by integrating what you’ve learned into your everyday life. If you’re tired of vocab cards and verb conjugations, listen to a song in your target language and try to translate the lyrics, or read a book from that country — you could even watch your favorite movie in English and throw on Spanish or French subtitles, if that’s what you’re into. You’ll knock out some R&R while improving your language skills at the same time. Or, shop for ingredients from your target language’s country and cook a meal from that culture — the options are endless. Inspired to start studying? Use these time-management tips to customize your own language game plan — and then dive into learning! Click the link below to choose from over 70 world language courses — complete with cultural insights and real-world dialogue. What’s your time-management game plan for learning a language? Let us know in the comments below!